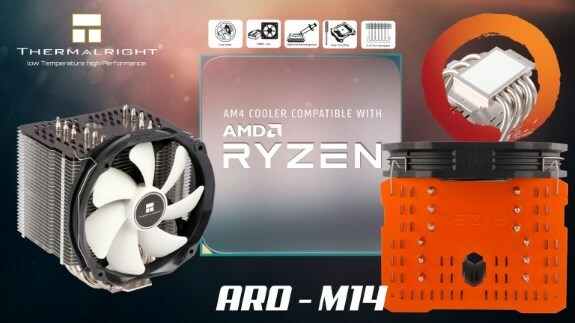 ThermalRight showcases the ARO-M14, a new HSF designed for AMD's Ryzen processors. Two variant are offered, the ARO-M14G with a brownish top and the ARO-M14O with an orange top. Both models feature a nickel-plated copper base, six nickel-plated copper heatpipes, a large aluminium fin array, and a Thermalright TY-147A low-noise fan. The heatsink measures 140mm x 115mm x 162mm (L x W x H) and weighs 720g. The included 140mm fan spins at 300 to 1300RPM, with a maximum airflow of 73.6CFM and a noise level of up to 21dBA. Thermalright says the ARO-M14 is designed for up to 240W TDP. The cooler is exclusively for Ryzen 1000/2000 series processors, mounting tools for Intel CPUs aren't included. For Ryzen CPUs the new ARO-M14 will a great choice for users looking for a high-performance cooler with low-noise. ARO-M14 design is the culmination of years of experience and extensive development. The variety of look-alike coolers now offered by other cooler companies is proof of how well our design works. We would not be the leading manufacturer worldwide if we were not constantly improving our products. The ARO-M14 is improvements on the already highly acclaimed “IB-E” flagships Silver Arrow and Archon X2 and Macho Rev. B. We are true to our motto “innovate – don’t imitate”. Thanks to the use of innovations from years of experience and already used in our other high-end coolers we have improved the Macho Rev. B to the ARO-M14 for Ryzen CPUs.